Help your preschoolers and kindergartners learn the alphabet while you encourage reading and books with the Alphabet book kit. It's one of seven Make My Own Book Kits, by Linda Silbert, PhD and Al Silbert, EdD. Kids color, cut, paste, trace, and lace their own children's book with little or no help. And they begin recognizing the letters of the alphabet as they trace individual letters. Their self-esteem grows when parents and preschool teachers share the excitement of their finished project. 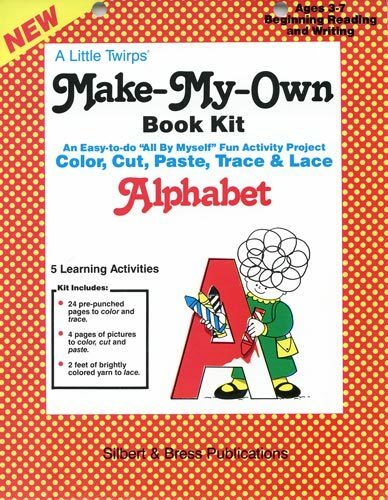 Pick up the "Alphabet Make My Own Book Kit" for your preschool or kindergarten kids today.